Hi, I am Minky. I am back again! また来ましたよ= Mata kimashita yo. 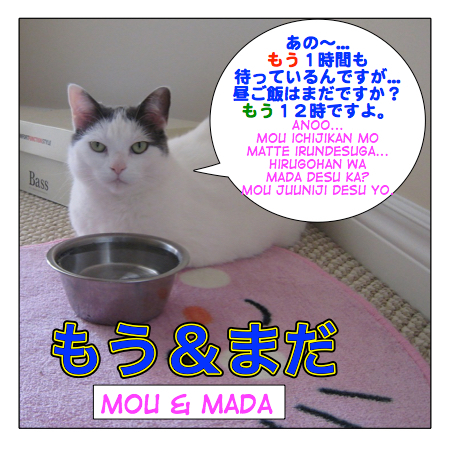 Today’s lesson is about もう ( = mou ) & まだ ( = mada). For example you just saw your watch and checked the time. = Mou konna jikan da. = Mada konna jikan da. = It is still early. = Half is already gone. = Half is still left. You both use them in negative and affirmative sentences. = Did you already do your homework? = Yes, I did it already. = I was already on the train at six today. = I could already write all the hiragana by the time I had turned four years old. = You are old enough to think for yourself. = It’s already July? Time flies! = It’s already the season of half sleeves. = I won’t see him again. = I won’t say such a thing again. = I won’t do that ever again. = I can’t stand this heat anymore. = I was still slim then. = Are you still there? = My child is still 3 years old. = Maggie Sensei, I still don’t know the difference between “mou” and “mada”. = Are you still mad about yesterday? = My mother thinks she is still pretty young. = There are still so many things in this world that we don’t know. = I thought my daughter’s elementary school graduation was still a long way away. = Your Japanese is really good. = It’s not quite there yet/ It is still long way to go. = I haven’t passed the level 4 yet. = I haven’t been to Japan yet. = I haven’t had “toro (fatty tuna) yet. = It is a waste to worry about something which hasn’t happened yet. = Minna, “mou & mada” no tsukaikata wa mou wakarimashita ka? = Do you know how to use “mou & mada” now? = Soretomo mou shitte imashitaka? = Or did you already know how to use it? Is it before the verb? Before or after the particle? All try mean the same in google translate. First the sentence itself is wrong so let me change it a little. Hi, 先生!! I’m having trouble understanding the difference between まだ～ていません and まだ～いません. So まだやっていません is wether you have done/finish doing something that you are supposed to do. まだやりません is used when you express your will. :you decide not to do something yet. What is の after 過ぎる here? When exactly we use this phrase? Can you give me a situation please? 3.”もうそんなことは言いません。” can we say そんなことはもう言いません”? Hi again. Someone has been studying hard! Give me a break/That’s enough. 4. 世界 / 世の中 are both translated as “world” but they are slightly different in Japanese. For the world in global meaning, you use 世界 and you use 世の中 to refer to the world where you actually live / one’s environment. Could you explain the difference in nuance between mat a and mada, they are similar, but not interchangeable, when do I use which one? Thank you so much for this site Maggie Sensei. You’re the best! I hope I’m not too late to ask a small question related to this lesson. You say that the meaning of もう changes depending on whether the sentence is affirmative or negative right? I was wondering, what about when you use もう with certain “negative-like” affirmative verbs . I mean verbs like やめる, 諦める, ほうっておく. Those verbs usually mean that the subject is stopping or not doing an action or something, right? So how should I understand a line like “私はそれをもうやめる”? Does it mean “I’m going to stop doing that already”, or “I’m going not going to do that anymore”? Sorry if that’s a stupid question, but I wonder how a naive speaker like you understands it. Great question! やめる can be “stop doing something” or “will not do something what you have been doing” so the translation could be both. 私は彼をもうほうっておきます。= I will leave him now. / I won’t take care of him anymore or I will not worry about him anymore. I see. Thank you for the response, Maggie Sensei. Maggie Sensei’s site has been translated, French, Spanish, Turkish, German, Russian and Polish. If it is just a couple of lessons and add the link to the original lesson, I think why not. You can post a link to the original lesson using the comment section. People who speak Portuguese will love to read the translation. Hai 先生, how can I make a past sentence with an adjective being a noun modifier? is this a correct sentence? This was a quiet town. = Mada [missing] [kinou no koto] okotte iruno? maggie i need help with my 聞き取り. i have been using tv and youtube to train my listening comprehension since when i started studying japanese(its been almost 1 year) and its still bad. some japanese speak too fast. do you kwow any good website to help with it? This site introduces a lot of good sites. I am glad your found us!